Various well-documented reports have now confirmed that Bashar al-Assad’s forces used highly toxic gases in several attacks on civilian areas across Syria in April 2014. According to the Violations Documentation Centre, three barrel bombs loaded with chlorine were dropped on the rebel-held village of Kfar Zeita near Hama on 11 April 2014. The following day, another similar attack was reported. Chlorine is a toxic gas that was widely used during World War I. It is a relatively cheap and widely available substance (liquid chlorine is used in swimming pools, for example) but can be highly toxic and even deadly. The chemical symbol for chlorine, CL2, was visible on the side of one of the canisters used in the Kfar Zeita attacks, along with the logo of Norinco, a Chinese company that manufactures chemicals and explosives. About 100 people in Kafr Zeita suffered “unprecedented symptoms”, including suffocation, dry cough, bloody cough, foamy saliva and vomiting. Most are said to have recovered after first-aid treatment. Two more people, a young girl and an elderly man, died as a result of direct injuries caused by the explosions. 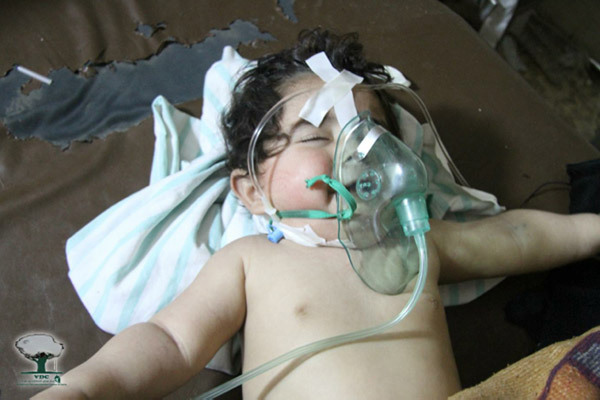 However, the disastrous effects of chlorine attacks in the long run have been widely ignored by media reports. When chlorine burns in the wake of an explosion, it produces a highly toxic substance called dioxin. Dioxin is one of the world’s most lethal substances. The World Health Organization said in 2010, “Dioxins are highly toxic and can cause reproductive and developmental problems, damage the immune system, interfere with hormones and also cause cancer.” The US Environmental Protection Agency (EPA) said in a 2012 report that dioxin has “potentially serious effects at ultra-low levels of exposure.” Other studies have linked dioxins to neurological effects and skin disorders. A few days before Kafr Zeita chlorine attacks, Syrian opposition sources had reported similar attacks – using toxic gases – on various suburbs of Damascus, particularly Harasta. The latest attack on Harasta was said to be the third of its kind this month (see http://orient-news.net/?page=news_show&id=78692). In both cases, activists posted videos and photographs of the attacks and of people being treated afterwards, claiming the regime had, once again, used toxic gases against civilians. But their warnings were initially dismissed by international powers. The US ambassador to the UN described the Kafr Zeita reports as “unsubstantiated”. As with the Gouta chemical attack in August 2013, Syrian state television and other pro-regime propaganda outlets blamed the attack on al-Qaeda. And as with Ghouta chemical attack, the UN and other international powers initially dismissed Syrian activists’ reports , until international media picked up the story. It is worth remembering that these recent attacks not only amount to war crimes (in breach of the Geneva Protocol 1925 that prevents the use of asphyxiating and poisonous gases during warfare) but are also a breach of the Syrian regime’s commitments under the Treaty for the Prohibition of Chemical Weapons, which the Syrian government joined under pressure on 10/14/2013. The latest chemical attacks would not have taken place without the massive military and economic support the Assad dictatorship gets from the Iranian regime and its supreme leader, Ayatollah Khamenei. His foot soldiers in Syria – Sepah Pasdaran, Hezbollah Lebanon and Iraqi militias – are bearing the brunt of the fighting on the ground and keep the Assad regime alive. The recent use of barrel bombs mixed with chlorine, which could not have taken place without their knowledge, is a murderous method of terrorizing civilians – the smell of burning chlorine spreads panic as people believe it may be sarine or other deadly gases like in the 2013 Ghouta attacks. But what victims may not know is that dioxin is spread when chlorine burns. Isn’t it time for the international community to respond to this war crime in an appropriate way?